Library to the left, kitchen to the right at BOX Studios’ Chicago office. All photos courtesy of BOX. In February, BOX Studios moved into their new office studio in Chicago. 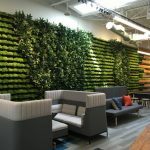 We tracked down BOX principal Ferdinand Dimailig to find out how the new space is fostering a better employee experience and as a result, higher employee engagement. What is the current state of employee experience and engagement at BOX Studios? I view experience/engagement as a necessity in our mentoring process. I believe in order to grow [properly] in this profession, company leaders need to foster this type of culture in order to meet the current demand of the “Gen X” and “Millennial” generations. What are some of your strategies at BOX to foster better employee engagement? We recently just moved into our new office studio in February. We designed the space as an open environment to nurture engagement. Our staff is working and configured in a linear benching furniture system. We also have formal and informal meeting environments throughout the space that incorporate low/high technology (AV/Touch-Screens/WFI/Writable Glass & Walls) to encourage collaboration. Outside of our office environment, we keep our team exposed to varied situations in the profession. Whether it’s in the office or in the field, any type of experience — good or bad — will help nurture individual growth, while also keeping employees engaged. Keeping ahead with technology is another good strategy. Since technology is constantly changing, our staff is always interested in the latest and greatest technologies that can advance their skills. As previously mentioned, we have incorporated many of these items into our new studio. Whether it’s in the office or in the field, any type of experience — good or bad — will help nurture individual growth, while also keeping employees engaged. Lastly, “information sharing” is another great strategy. Our team is often sharing professional experiences, product information, industry lectures, etc. via word of mouth, instant text, and e-mail. We actually have a person in the office that is responsible for keeping the staff informed through the firm’s event calendar. All the ideals previously mentioned become our unique expedited learning environment, I call “IT 2.0”, also known as “Integrated Training on Steroids”. A small conference room at the BOX office. In what ways have you and your colleagues worked to understand people’s needs to better foster engagement through design? We consistently encourage a learning environment at BOX Studios. While many firms shy away from taking billable time to educate their staff, we have engrained this process into our culture. For example, we consistently have vendors coming in and out of our office daily. I won’t share exactly how many educational experiences (15 min Ed/Lunch+Learn/After-hours showroom visits) we have in a month, but I would definitely say it is way beyond the standard. Aside from vendor experiences we have monthly internal “Lunch & Learns” on topics like technology, operations, code, etc. We also heavily invest time in exposing our staff to the other aspects of the design profession. Areas that our team maybe interested in, like business development, marketing, permit expedition, code compliance, graphics, social media, etc. Our company goal is to expose the team to as many “professional experiences” as possible, in order to expedite the learning curve. This, in-turn fosters a “well-rounded” design professional with varied experiences that will ultimately pay dividend at a much faster rate. We listen to our colleagues and value their input. From our senior level staff to the interns, we encourage feedback and constructive criticism that will make BOX Studios better. Lastly, but most importantly, we listen to our colleagues and value their input. From our senior level staff to the interns, we encourage feedback and constructive criticism that will make BOX Studios better. Our team knows we have an “open door” policy and that our leadership downplays the corporate process, in order to move us forward. The other half of the new kitchen. Can you describe a recent project that you’ve worked on that you feel really leverage this internal approach at BOX? 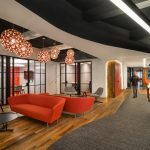 We recently completed a project for our client, Getty Images in Chicago. The team was made up of me (Principal In-Charge/Senior Designer), our Technical Director, a Mid-Level Interior Designer and a Junior Designer (JD). The day-to-day process was actually led by our JD, who ran the show with the rest of the team’s assistance, guiding and mentoring. The practice was successful because the JD was professionally prepared through our expedited learning system (just over a year at BOX Studios). Through our observation, she had proved ready to take on the challenge. Leadership, in-turn provided her the opportunity and she did not disappoint! Not all our projects are run in this manner. But our developed system seems to definitely mature our professionals in an expedited fashion beneficial to a growing firm. How do you measure the “success” of a space that’s been designed to promote engagement? What BOX Studios has experienced via this process is a successful and thriving practice! Our mentoring process of expedited interactive training with all staff levels of experiences for has proven to be a culture dynamic that we have continued to foster in our organization. It has enhanced our client experiences, in-turn leading us to continued business relationships, as well as referrals to other project opportunities. I would say that our current business status is made-up of 80-85 percent repeat business and client referrals.